Recovering from Trauma and Thriving in Life focuses on how to provide prayer ministry in a comprehensive way using the Thrive Principles: belonging, receiving and giving, trauma recovery, maturity, and coherent identity. All five of these thriving principles are usually problematic for survivors of trauma including those suffering from emotional and physical neglect as well as any type of abuse. Prayer ministry designed to target only one of these basic needs (recovery from trauma) will neglect the other four needs. Eventually this will impede progress and actually cause a breakdown in the capacity to function. All topics will address the overall learning objectives relating to the five essential elements for thriving in life and the impact of trauma in the brain’s control center when an individual does not have these healthy foundations. When emotional neglect and/or abuse occur, various levels of the brain’s control center will be impacted differently. The appropriate interventions will be demonstrated for each level. Lectures will teach the five essential elements for thriving in life and the corresponding symptoms of pain in the five areas of the brain’s control center. A panel of individuals will be interviewed demonstrating symptoms of the five areas of pain in the brain. Live demonstrations of client sessions provide observations and time for questions. 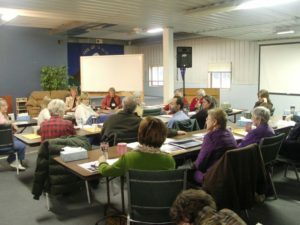 Observe prayer ministry sessions utilizing the five Thrive principles for developmental growth. Understand the impact of trauma on the brain’s control center and the process of recovery from trauma. Identify goals and tasks to address maturity deficits and apply appropriate interventions. Become familiar with the 19 different skills to apply to traumatized individuals, including non-verbal skills. Learn to apply the 19 skills for each level of pain experienced in the brain’s control center. Practice some of the skills in didactic pairs and groups. How does trauma impact your life, your brain, and your walk with God? The brain can experience emotional distress and de-synchronization in any part or all five areas of the brain depending on the amount and severity of trauma experienced. Since trauma stunts our active growth process it adversely affects our relationships with one another and our relationship with God. Which main part of the brain is helped by prayer ministry? All five levels of the brain must be synchronized in order to achieve effective, long-lasting results in prayer ministry. Prayer ministry is successful as long as the left and right hemispheres of the brain stay synchronized. Once we lose synchronization between hemispheres, we can no longer verbalize what we feel. This happens frequently with survivors of any type or trauma. At the point that words are no longer effective, we need further steps to preach the non-verbal Gospel to those who suffer. How many areas of the brain usually register emotional distress in a severely traumatized individual? There are five primary levels of the brain which God designed to be synchronized and working together. When we are fully mature and living life to the full, all five areas work together! Once traumatized, we lose our ability to synchronize these five levels. At this point we are stuck in great distress. For the severely traumatized, usually all five levels are in distress and even those who have experienced only prolonged emotional neglect will also register pain in all five levels! Will prayer ministry alone help alleviate emotional distress experienced in other parts of the brain? No! God designed the human brain to be relational with Him and with each other. He set us in families in order for us to receive the five essential elements for brain growth, which are: belonging, receiving and giving life, trauma recovery, maturity, and knowing your heart. If any of these elements are missing, it impacts our ability to be fully mature in relationships – even with God. Can prayer ministry cause more distress if the emotional pain in other areas of the brain are neglected? Yes! C.A.R.E. counselors are consulted most frequently by frustrated prayer ministers who have reported that their use of prayer ministry has resulted in more distress and decreased functioning in some of their clients. Trauma recovery work surfaces very intense, distressing emotions. The brain’s capacity to handle distressing emotions should be assessed as well as the needed joy strength before plunging into trauma recovery work through prayer ministry. How do you recognize which part of the brain is in emotional distress and how do you intervene? C.A.R.E. counselors have been specially trained to recognize and assess emotional pain at all five levels of brain de-synchronization and apply the correct interventions for the given problem. If you are not getting the relief and results you need from prayer ministry, and you are the counselee, consider an intensive prayer time with us. Or if you are a prayer minister, consider our internship training today! C.A.R.E., Inc. is primarily different from other prayer ministries because the C.A.R.E. staff have been trained comprehensively to assess what levels of the brain have been impacted by trauma and to make the intervention appropriate to the problem of emotional distress in all five areas of brain synchronization. We specialize in treating severe trauma including Dissociative Identity Disorder (DID), Ritualistic Abuse and mind control. We address sin patterns (strongholds), false beliefs, root lies, false identities, and emotional distress utilizing Biblical truth, prayer, deliverance, and emulating the character of Jesus the Messiah through the fruits of the Holy Spirit. We provide community to address the need to belong and an environment that fosters growth and maturity. Cheryl Knight and Jo Getzinger began C.A.R.E., Inc. in 1991 to help survivors with histories of severe abuse recover from trauma. They specialized in treating dissociative disorders and traumatic abuse for many years. Those they were helping were not fully recovering in a clinical setting, and they began a community where survivors had a place to belong, to both receive help and learn to give to others, to learn to cope with distress in a functional way, and to discover who God created them to be. The C.A.R.E. community is an opportunity to practice that God-given identity with others who have experienced similar histories and are learning to overcome trauma and thrive in life. From 2002 through 2006, C.A.R.E. hosted the THRIVE conferences featuring speaker Dr. James Wilder, one of the authors of The Life Model: Living from the Heart Jesus Gave You, equipping us with important information about basic Thriving principles. The important information on our basic Thriving needs, coupled with our daily experience of living and practicing these principles in a setting within the C.A.R.E. community, provide a comprehensive training ground for internships and seminars. Cheryl has worked with trauma survivors since 1989. She coordinates the development of new project ideas in accordance with the needs of the target population. Cheryl authored Surviving In Sanity, a book about spiritual warfare. She has co-authored two other books on survivor topics with Jo Getzinger. 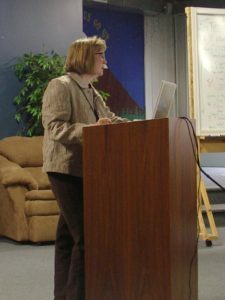 Jo began working in the field of trauma recovery in 1989. She oversees and provides intensive prayer ministry to the severely wounded. She develops and coordinates conferences that C.A.R.E. sponsors to educate communities about ritual abuse and other severe abuse issues. She provides consultations to therapists, survivors, pastors, etc. She develops, oversees and is responsible for the clinical aspects of all C.A.R.E. programs. She presents at seminars and conferences, including the THRIVE conference. The C.A.R.E. 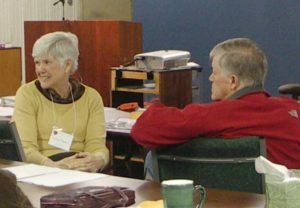 Seminar program offers participants an opportunity to experience the Body of Messiah as the source of healing through which God brings redemption to the individual suffering from deep wounds. While this statement is very true for the survivor, it is also true for the helper. We have all been wounded from some experience and we all have blind spots. Community is God’s plan and provision for dealing with our deep-seated individuality and self-will. Since the inception of the C.A.R.E. community in January 1999, the C.A.R.E. staff have witnessed the healing of survivors expedited through community. The staff have also witnessed problems and issues addressed that we are convinced would never have been discovered without a body of Messiah Community. Ironically, the staff can also say that community life has been life-changing, not only for the survivors but also in dramatic ways for the staff as He transforms us more into His likeness. Reserve Your Seat in Our Next Seminar Today! Call 231-745-0500 or click here to email to let us know you are interested.